An electrical system failure can literally leave your building in the dark, crash your computer system or send critical timers into erase mode. Calvert Mechanical Solutions Master Electricians are adept at prompt and professional commercial electrical system repair, often being called in behind another firm’s failed attempt. We provide cost-efficient electrical solutions to clients in the central Maryland area. Whether the problem arises at the panel or in a branch circuit, whether the issue is a breaker or a feeder, Calvert is the expert in troubleshooting and diagnosis that results in a thorough electrical repair, restoring power and getting you back in business fast. Our expertise includes exterior electrical repairs, with commercial parking and outside area lighting repairs receiving the same prompt attention as the most delicate indoor situations, such as IT circuits or UPS devices. In fact, Calvert is often tapped for consultations on energy efficiency for indoor and outdoor lighting systems. 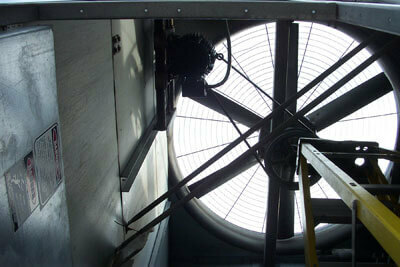 Calvert is also qualified and has expertise in providing analysis of the quality of power coming into your building. Our Power Analyzer can detect phase issues as well as other power problems that could affect the equipment in your building. Calvert’s team is ready to provide 24-hour emergency service wherever and whenever needed. Please call (410) 323-5400 and follow the prompts to reach the emergency manager on call. The men and women of Calvert Mechanical Solutions plan, install, service, and repair the critical HVAC, plumbing, electrical, and energy management systems for commercial clients in the central Maryland area. Taking pride in our workmanship and committed to the use of the best materials available, Calvert seeks to be the economical choice among local contractors. As part of the community for nearly three decades, Calvert embraces an unequaled work ethic and a pledge of honest and responsive performance for the clients who entrust their facilities to our care.